Sansuk Town Village 2. The secure estate is located behind the temple at the eastern end of Soi Nern Plab Wahn in East Pattaya. 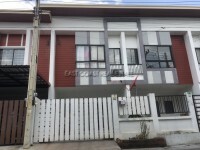 The 2 storey home is sat on a 20 sq.wah corner unit.The bedrooms are both a good size with the master being en-suite with a hot water shower.